These psychedelically-minded musical bloggers have been blasting a few tunes our way every now and again for a few years now, but I think this is one of the better efforts I've heard from them. We're Late For Class is a rather free-form grouping that records whatever abstractions fits their mood at the moment, and it seems that they were in a jazzy, space rock mood for this one. The production quality here is also a nice step up, with a hazy, crisp vibe propelling the sounds into interstellar space. I'm also a sucker for the kind of cosmic cover art that this one sports, and the music reflects it pretty well. We've got two tracks here that almost form a bit of a musical suite. 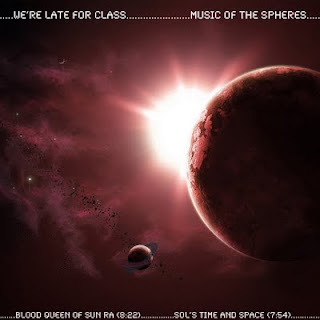 "Blood Queen of Sun Ra" shuffles along the rings of Saturn, and includes some groovy samples from god knows where. "SOL's Time and Space" drifts along a more conventional, but well played Floydian strut. There's some vibraphone, or xylophone, or somethingmaphone that brands the track with a nice, unique musical identity. Wow, thanks a million, Doc. Not just for listening to our ramblings, but for promoting so many others, too. We appreciate the space and time. All the best.